Back in 2011, I ended my “Rise of the Planet of the Apes” review excited about what the future held for the rebooted series. As the screen went dark and the credits of “Dawn of the Planet of the Apes” began to roll, I realized my high expectations had been met just three years later. If “Rise” hit all the right notes of an introductory chapter, then “Dawn” was even more on pitch with the rising action of a second act. 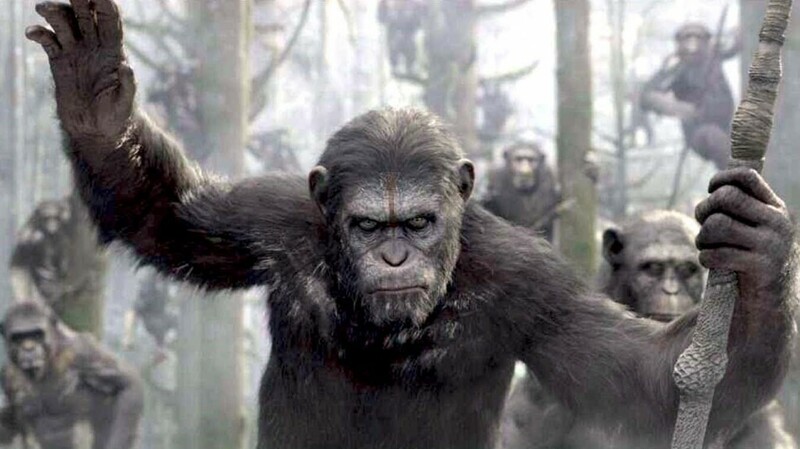 The story begins ten years after “Rise” with the advanced apes, led by Caesar (Andy Serkis), living happily in the forest outside San Francisco, and humanity in tatters as a result of the Simian Flu. With only one in five hundred humans immune to the disease, communities of people are few and far between. The group of humans in San Francisco, led by Dreyfus (Gary Oldman) and Malcolm (Jason Clarke), find themselves in a precarious spot. With only two to three weeks of electric power left, they need to access the generator at a hydroelectric dam in the very same forest Caesar and Company call home. Caesar, with his warm upbringing in a human home, has more hope for peace than Koba, his top lieutenant and a former victim of human experiments. The former chooses to trust Malcolm, giving him supervised access to the dam, while the latter believes they must strike while the humans are weak and desperate. Anyone who has seen the trailers knows that all does not turn out well. There are scenes of kindness and friendship between human and ape, but unfortunately there is anger, betrayal, and bloodshed in greater quantity. It is a marriage doomed for failure. While the trajectory of the film may be a tad predictable, the finer details are not as obvious, and director Matt Reeves peppers this thing with thrills and emotional moments galore. He has a sure hand indeed and 20th Century Fox was smart to sign him to direct the next picture in the franchise. I wasn’t a fan of his 2008 effort, Cloverfield, and I preferred the Swedish version of “Let the Right One In”, but here, without question, he was the right guy for the job. Speaking of the right person for a job, there is no motion capture actor out there right now to rival Andy Serkis. Yet again, he IS Caesar, and the argument will be made (rightly so) that there should be an Oscar category for performances like this. Toby Kebbell is also fantastic as the envious, paranoid, and perhaps a bit psychotic, Koba. 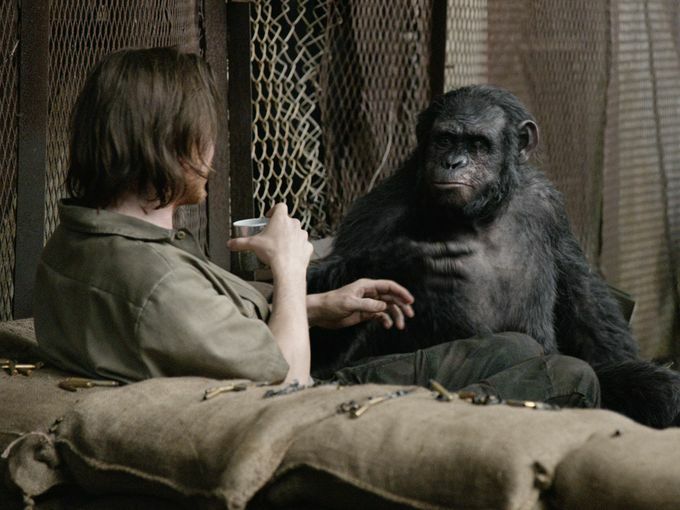 Truth be told, the apes are the star here, but the human performances, particularly those of Oldman and Clarke, are fine too. 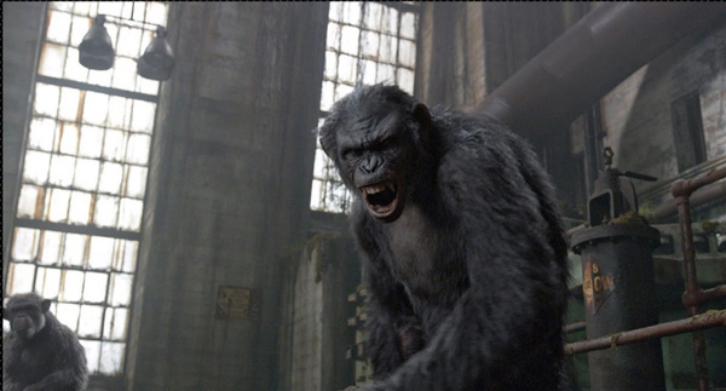 Back to the magic of those apes… The work of New Zealand based special effects house Weta Digital is simply outstanding, yet again. Back in the mid-90’s I argued with a friend of mine that Weta, based on their work in Peter Jackson’s The Frighteners (this was half a decade before Lord of the Rings and thirteen years before Avatar! ), was on the same level as Industrial Light & Magic. Looking back I was probably wrong, they weren’t as good as ILM at that time. But in a sense I called it, did I not? Weta is certainly the equal of ILM now, and many would argue their superiority. One look at their work here and it’s obvious we are in the presence of incredible artists. All of this comes together effectively, a few and far between occurrence among summer blockbusters these days. Flesh and blood actors, motion captured computer animated performances, solid drama, well crafted action setpieces, you name it and it has been done well. The screenplay, despite going through rewrites and having three names attached to it, clearly laid a great foundation to be built upon. In short, it was even better than “Rise of the Planet of the Apes”. Yet again I find myself looking forward to the next film in the franchise, and this time we won’t have to wait as long! This entry was posted on Friday, July 11th, 2014 at 9:27 am	and is filed under Film, News. You can follow any responses to this entry through the RSS 2.0 feed. You can skip to the end and leave a response. Pinging is currently not allowed. « Final Season for ‘Glee’ Announced, Season Six is the End!! !